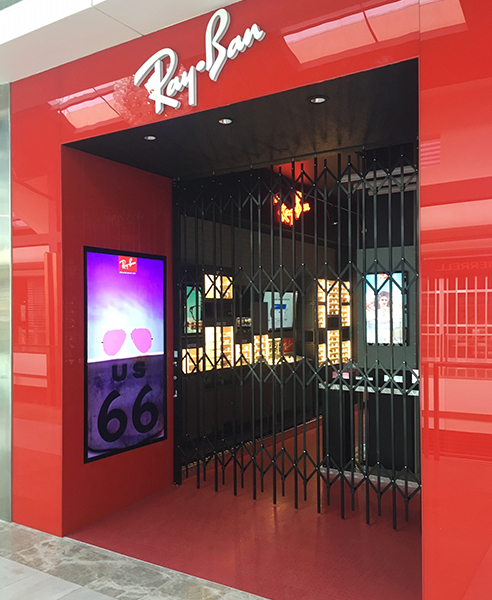 The Australian Trellis Door Company (ATDC) has successfully finalised a security installation of its shopfront closure doors for Rayban, Westfield Doncaster in Melbourne. Rayban is the global leader in the premium eyewear market and is owned by Luxottica, an Italian company based in Milan, and is the world's largest company in the eyewear industry with over 7,400 stores across the world. Other divisions include Persol, Oakley, Sunglass Hut, and Sears Optical to name just a few. ATDC has performed multiple installations across the Luxottica property portfolio. Working closely with project manager Focus Shopfit out of Perth, the project involved the installation of ATDC's S06 model, a folding door in a black satin powder-coated finish. Specified for its compact space-saving storage benefits and its seamless up/down locking mechanisms, the unique patterns and edgy appearance of the closure are quite striking as is apparent from the above images. For further technical information on these doors refer to ATDC's website. I would like to enquire about The Australian Trellis Door Co Pty Ltd.